Resort town in Italy called Taormina has a long history. All over the world it is known as the concentration of artists, writers and other creative professions, as every year, in summer, there is a festival of the arts. All activities are held in Taormina Greek Theatre, around which the city was formed. While vacationing at this resort, you can spend time on the beautiful beach, enjoy the sights, spend time shopping trips, etc. 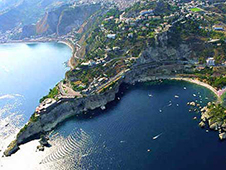 And in order to spend the least time on the move, you can take advantage of car rental in Taormina, and pick up a reserved site with the help of bookingcar.ru transport in the city center. On roads and highways is permitted speed traffic, but not more than 110 and 130 km / h respectively. Italian city car parks and a variety of different Taormina - is no exception. "Green" (free at a specific time or day of the week). Underground parking - the most expensive. There is always a free space, which is engaged in the search for personnel, not the driver. Free parking found near the shops, shopping malls, toll - close to major attractions. In the country the average price of gasoline - 1.7 euro diesel - 1.5 euros. In Taormina common self-service gas stations. Refuel them more profitable due to lower fuel prices. The cheapest is considered 95th gasoline called Super senza Pb. For transport, which runs on gas, are provided with appropriate filling of LPG.